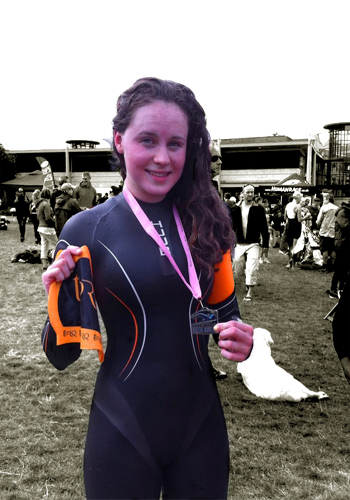 TORQ swimmer Victoria Pritchard hadn’t heard of the Henley Mile and Henley Classic races before, but got the opportunity to race this one and was really glad she did it. Unfortunately I was away racing at a regional ESSA event and missed the Classic race (I didn’t miss the very early start though! ), but was available to swim in at the Henley Mile race. I had been ill the night before, but I wanted to give it try and see how the race went; I didn’t tell my family as I know they wouldn’t take me if I’d been ill, so we went anyway and got to the race venue nice and early – almost too early infact as we struggled to find an entrance that was open! It had rained a little over night and so I was expecting the water to be a little cooler than of late, but it wasn’t too bad especially as I was expecting a wetsuit event. In the end it was measured at 19°C which was absolutely fine. The race itself was a ‘Suits vs Skins’ event where you swim the mile race firstly in wetsuits and then a couple of hours later in racing skins. There were some really good swimmers here to race against including Olympian Kerry-Anne Payne, Fern Davies and Michelle Webber (2012 FINA World Junior Open Water Swimming Champion). In the mens event my TORQ and Hatfield team mate Caleb Hughes was racing along with his brother Nathan and former FINA World Cup winner Chad Ho and British International Tom Allen (Ed. look out for his report coming soon). In the first race, the wetsuited Elite race, I unfortunately got a bit of a slow start as I was somehow poorly positioned and therefore got swam over, this meant the other elite competitors got a meter or two on me, but more importantly put the next group of competitive swimmers onto me also. It took about 400 meters of jostling to escape the pack behind and get back after the leaders. The lead pack also contained the leading Elite men and I kept trying to haul back to the lead pack and get back onto them for the rest of the race. Fern Davies was swimming with me and she passed me with about 200M to go. I was starting to feel a little ill when I realised that I really needed to raise the work rate, but had to keep my kick at slightly reduced power due to not feeling great, and could do nothing about getting past her. It turned out that Kerry-Anne Payne wasn’t fit and never intended to race the whole distance. After a few hundred meters, she hung back and was giving tips and chatting with other swimmers who were probably very surprised to see her alongside them! The result of this 1st of two races was that I placed third female – a fair result given the poor start. At this point I was tempted to pull out of the Skins event and go due to my sickness, but I thought I’d see how I felt in an hour or two. And so by mid-morning the sun came out, the temperature improved and I started to feel much better – as you do when the sun shines! In fact I was even looking forward to the Skins race and had forgotten all about how I’d felt earlier in the day. This time I was determined to do better with my race-craft; to swim technically better and get away “On the B of the bang” – as Linford Christie used to say and “be just a little more assertive” in dealing with any traffic. I did get a good start and was on the right hand side of the lead pack, and as the pack developed a spearhead, I dropped in behind and I knew that if I stuck with that lead pack it would be a fast race. Our pack had soon developed a substantial gap to the rest of the field and I found I could hang in there with these leading men reasonably well and I even moved closer into the pack as we reached the finish gantry – a great race! What I didn’t know was that one of my main competitors had also done a similar thing on the other side of the spearhead and came in just a couple of seconds before me with Caleb Hughes (TORQ) and the other Elite men. I was really quite pleased to be second woman home as the other Elite women were all a very high international standard. As I write this report, the official results are not yet online so cannot be 100% confirmed, however in the end it was really good day and I was happy with my swims and I’m already looking forward to next year’s race.